Glypican 3 Overexpression across a Broad Spectrum of Tumor Types Discovered with Functional Genomic mRNA Profiling of a Large Cancer Database. Am J Pathol. 2018 Jun 20. pii: S0002-9440(18)30129-9. doi: 10.1016/j.ajpath.2018.05.014. Moek KL, Fehrmann RSN, van der Vegt B, de Vries EGE, de Groot DJA. Glypican 3 (GPC3), a membrane-bound heparan sulfate proteoglycan, is overexpressed in ∼70% to 80% of hepatocellular carcinomas (HCCs), but uncommonly expressed in healthy tissues. This raised interest in GPC3 as drug target, and several GPC3-targeting drugs are in clinical development. We therefore predicted GPC3 protein overexpression across tumors and validated these predictions. Functional genomic mRNA profiling was applied to expression profiles of 18,055 patient-derived tumor samples to predict GPC3 overexpression at the protein level in 60 tumor types and subtypes using healthy tissues as reference. 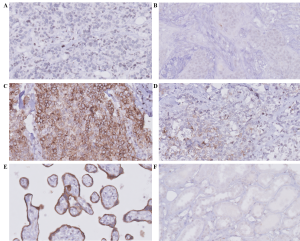 For validation, predictions were compared with i) immunohistochemical (IHC) staining of a breast cancer tissue microarray and ii) literature data reporting IHC GPC3 overexpression in various solid, hematological, and pediatric tumors. The percentage of samples with predicted GPC3 overexpression was 77% for HCCs (n = 364), 45% for squamous cell lung cancers (n = 405), and 19% for head and neck squamous cell cancers (n = 344). Breast cancer tissue microarray analysis showed GPC3 expression ranging from 12% to 17% in subgroups based on ER and HER2 receptor status. In 28 out 34 tumor types for which functional genomic mRNA data could be compared with IHC there was a relative difference of ≤10%. This study provides a data-driven prioritization of tumor types and subtypes for future research with GPC3 targeting therapies. June 24, 2018 in Publications, Science.